Getting ready for your first pedicure? While each place will certainly be a little different in one way or another, I’ve been to enough nail salons and day spas to say that this is the basic procedure you go through when getting a pedicure — no matter where you go. 1. Walk-in’s welcome. Usually this is the case. Some of the nicer full-time spas like to require reservations, but even they will generally accomodate a walk-in visitor — if there’s someone available at that time to do your pedicure. 2. A big fat smile. At every single facility I’ve ever been to for a pedicure, I’ve always been greeted by a warm welcome and a cheery smile the moment I walked in the door. It’s quite nice. At this time, they invite you to pick a nail color of your choosing from the “wall of nail polishes”. They’ll apply this polish to your toes right before you leave. 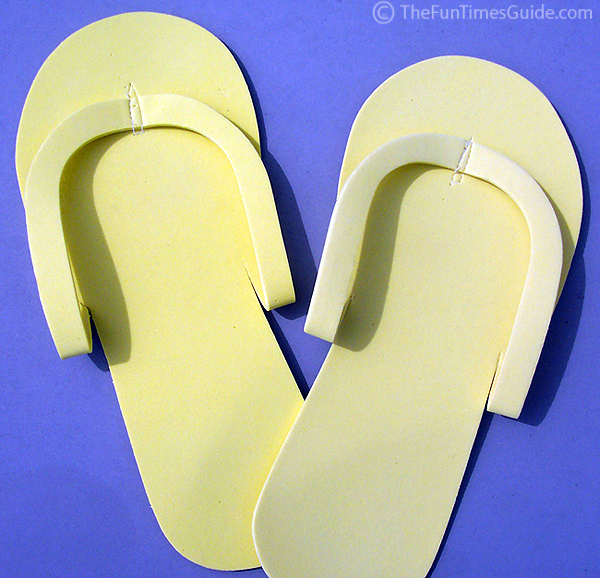 This is what the Flip Flips look like… They’ve got a bit of cushioning to them. And they come in lots of fun colors. These things are so “cute” I even saw a pair for sale at the Goodwill Store yesterday! Yep, right there next to the high heels, tennis shoes, and “regular” Flip Flops… there was a pair of blue Flip Flips. Who knows?… Flip Flips might become so fashionable, they replace bowling shoes as the next “gotta have it” retro shoe! 4. A personal assistant. I always feel like I’m being “waited on” when I’m getting a pedicure. They try to do anything in their power to make it a comfortable and pleasant experience for you. (So you’ll want to come back!) I’ve never met more agreeable and complimentary people than those in nail salons and spas. 5. Pure relaxation. While they’re catering to your every foot-related need, you are encouraged to just relax and enjoy. Just don’t fall asleep, cuz you need to know when to switch feet! When prompted you have to repeatedly get one foot out of the “spa water” and put it up on the footrest so your pedicurist (is that a word?) can work on it, while at the same time you put the foot he or she just worked on back into the water. Between each and every step, your feet are soaking in warm, bubbling water! It is at this point that you are finally required to step out of la-la land and exhert a little effort as you move from one chair to another. You are escorted from your comfy personal massaging chair to a different chair that’s situated in front of a nail dryer. These are really cool… I want one! There’s a nail dryer for fingernails — that’s placed on the tabletop, and a nail dryer for toenails — placed at floor level. Before you get your very first pedicure, you may want to go with someone to witness exactly how things are done at that particular salon first. I say that because cleanliness and how they sanitize their tools are important to me. Most places are obviously clean and the tools they use have been obviously sanitized, but you really don’t know unless you’ve been there before. And if you have any questions… ask! If they don’t have the answer you’re looking for, move on. There are tons of great salons out there. At one salon I go to, they place all of the items they’ve used during my pedicure into a microwave-looking machine which completely sanitizes them in a matter of minutes. And for items like that callous remover — with the thin razor blades — they use a fresh-out-of-the-package razor blade just for me. I watch as they open it. And I watch as they throw it away. And the tool itself is one that gets put into the sanitizing machine. I don’t know whether it’s the brand of nail polish (usually O.P.I. at the places I go), the type of base coat & top coat they apply, simply the act of “baking” on the nail polish as you sit in front of those dryers for about 15 minutes, or a combination of all of the above — but my nail polish definitely lasts longer! And it never chips after a pedicure! Never ever.